Jean Mason, a bookshop owner in Toronto, is surprised one day to be told by one of her regular customers that he's seen her somewhere else - somewhere she's never been. The person he's seen is not Jean, however; it's her doppelganger. And upon hearing from others that they've seen the doppelganger too, Jean becomes obsessed with finding her. 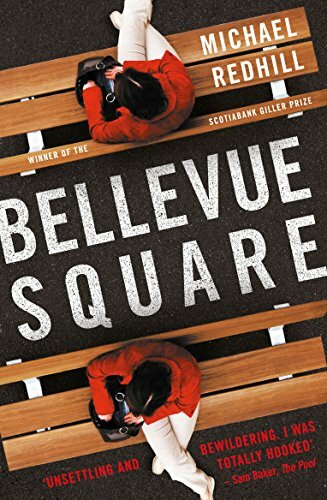 Spending hours at a time in Bellevue Square, Jean enlists the homeless, addicted and mentally ill people who hang around there in helping her track down Ingrid, her mysterious double. But what will happen if Jean and Ingrid actually meet? And why are other aspects of Jean's life gradually starting to make less sense? At times, Bellevue Square is surreal and dreamlike, but this works best when it isn't overdone and there are times when it's all just a bit much (I feel much the same way about the films of David Lynch, of which this book does rather remind me). There are moments that are genuinely quite chilling, and I think these moments are when Bellevue Square is at its best. The overall premise is strong and the psychological ambiguity is cleverly done; we've really no idea throughout the book what's 'real' and what isn't and just when we think we've been given a clue, the author subverts our expectations. In many ways, Bellevue Square feels like two different books spliced together. Perhaps, given its subject matter, that's intentional on the part of the author, but it changes quite abruptly in tone from a wry, comic mystery into a dark, existential exploration of mental illness and the nature of the self, and I'm not sure it quite works as either. The colourful cast of characters and the whimsical wit of the opening chapters felt a little too self-consciously quirky for me and the shift in tone towards darkness as Jean's mental state becomes more and more distressed is jarring and, at times, rather exhausting.